Science fiction fans who love the vision and storytelling prowess of Octavia E. Butler are in for a treat with this up-all-nighter from a talented newcomer. 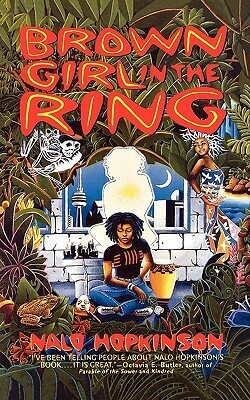 Set in 21st-century Toronto after a severe economic collapse leaves the inner city destitute, Nalo Hopkinson's splendid debut Brown Girl in the Ring fuses Afro-Caribbean soul and speech with the harsh realities of a dismal future. Placed within an intriguing landscape peopled by spirits, zombies, greedy politicians, and gangsters, this fast-paced adventure plunges Ti-Jeanne, a young single mother in the middle of a terrifying battle between good and evil. Damaged by riots and neglect after its economy collapse, Toronto has been abandoned by most of its desperate citizens. What is left is the "Burn," the crumbled ruins of the inner-city where Ti-Jeanne, her unnamed infant, Baby, and her herbalist grandmother, Mami Gros-Jeanne, have attempted to forge some semblance of normality amidst the wreck and rubble. Ti-Jeanne and Mami administer the meager supplies of medicine and herbal remedies they can muster to the rag-tag group of survivors who barter goods and services in the barren city. Yet Ti-Jeanne and her grandmother are not your typical residents. Mami is a staunch believer of obeah and a faithful follower of the spirits. Unlike her granddaughter, she knows all too well the power of the spirits-and the danger in displeasing them. Ti-Jeanne is a reluctant "seer woman" whose second sight feels more like a curse than a gift. She suffers from the same powers that drove her mother, Mi-Jeanne, raving into the night. Her ability to see far into the future as well as the haunting visions where the loas speak in riddles leaves her a reluctant and hostile apprentice. When she is visited by the Jab-Jab in an especially bewildering nightmare, Ti-Jeanne rejects her grandmother's inquiries about her previous visions. "What I was to tell you, Mami? I don't want to know nothing 'bout obeah, oui." Resentful of their intrusion on her lonely but orderly world, Ti-Jeanne believes that the Jab-Jab, the Soucouyant, La Diablesse, Papa Osain, and all of the African Pantheon of spirits and gods should have no role in the lives of sane and practical people; however, in the ravaged landscape of the Burn, the spirits are very much alive. And not all of the followers of obeah use their power for good. Unaware of the ominous legacy that threatens her family, Ti-Jeanne struggles to assert her independence from her loving but overbearing grandmother. As she attempts to understand her own mother's mysterious disappearance, Ti-Jeanne also labors under the burden of heartbreak. Despite Mami's warnings and her own instincts, Ti-Jeanne is still very much in love with Tony, the untrustworthy father of her child. After Tony's drug addiction got him fired from his job as a medical intern at one of the last remaining hospitals in the Burn, Ti-Jeanne packed up her things and returned to her grandmother's house. Although the house was already heavy with dark secrets, Ti-Jeanne returned with a secret of her own. Unwilling to give Tony the opportunity to disappoint her further, Ti-Jeanne left him without telling him that he was the father of her unborn child. When Ti-Jeanne stumbles across the frightening Crazy Betty on her way home, she decides to flee in the opposite direction and runs headlong into her ex-boyfriend and his troublesome friends. Although it is clear from his company that Tony has not mended his ways, Ti-Jeanne is hopeful. Longing for the stability she never knew in her own childhood, Ti-Jeanne clings to the dream that someday she, Tony, and Baby will make it as a family. Unfortunately, Tony's fate is indelibly tied to "the Posse," a dangerous gang led by Rudy Sheldon. A cold-blooded villain with an unquenchable thirst for power, Rudy has no qualms about dipping into his own bloodlines. By abusing the power of the spirits for his own ill will, Rudy has ruthlessly carved a place for himself in the Burn. With the help of his bloodthirsty duppy bowl and a handful of bumbling gangsters with names like "Crack Monkey," Rudy will stop at nothing to strengthen his stranglehold on the inner-city. When he commands his latest pawns to steal the heart of a "donor" to help the dying Prime Minister live to see her next election, Tony has no choice but to obey or run for his life. Desperate, Tony turns his charismatic charms on Ti-Jeanne, promising her that he will quit the Posse and change his ways if only she would help him leave the city. Unwilling to turn her lover away, Ti-Jeanne ask her grandmother Mami to seek the spirits' assistance, hoping that they will intervene and help Tony escape before the Posse kills him for his betrayal. Unwittingly, Tony then involves Ti-Jeanne in a nightmarish battle with Rudy, who sends the ravenous spirit entrapped in his powerful duppy bowl out to kill them. Enslaved by Rudy's evil obeah, the duppy must do his bidding or starve for the human blood it feeds upon. Unable to escape Rudy, Tony decides to complete his mission, only to discover that the compatible donor is a little too close to home. In the meanwhile, Ti-Jeanne learns the terrible secret behind Rudy's hated duppy bowl, and as the captive spirit stalks her through the war-torn streets of the city, Ti-Jeanne must finally face her spiritual heritage-or risk her life and family to hellish fate. A Canadian by way of Jamaica, Hopkinson says of her novel, "I use Afro-Caribbean spirituality, culture, and language, but placed my characters within the idioms and settings of contemporary speculative fiction. I saw it as subverting the genre, which speaks so much about the experience of being alienated, but contains so little written by alienated peoples themselves." Chosen out of nearly one thousand entries as the winner of Warner's First Novel contest, Hopkinson's first novel has received praise from science fiction mavens such as C.J. Cherryh, Tim Powers, and the reigning queen of science fiction herself, Octavia E. Butler. A highly imaginative and masterfully plotted debut written with the verve and skill of a seasoned writer, Brown Girl in the Ring signals the arrival of a bold, new talent in the science fiction and fantasy genre. Read Warner Books’s description of Brown Girl in the Ring.